OM VISA Consultancy - Global Immigration, Students, Visitor, Business & Work VISA Consultants: Compose writing General for Incredible Score...!!! OM INTERNATIONAL...!!! Compose writing General for Incredible Score...!!! OM INTERNATIONAL...!!! 10 tips for IELTS Writing, General Training! IELTS (International English Language Testing System) exam is a tool that helps to assess the English language skills of a person who is planning to fly abroad for foreign education, immigration or work permit. For those who pursue overseas education can attempt IELTS Academic, while others who seek immigration overseas or travel abroad on a work visa were ought to attempt IELTS Test General Training. Like other gateway exams IELTS also has different modules. In this blog we attempted to phrase the tips on IELTS General Training Exam which helps the test-taker to understand the writing tasks and score highest marks which contributes to its score. General Training Writing consists of 2 tasks. Task 1 will be either a formal letter or informal letter with duration of 20 minutes. Formal letters always will be addressed to an organization or authority, to complain or address a problem or appreciate for working on a request of public interest, opinion about a course of study or a place to visit by someone known and so on. Informal letter will be of the personalized form which includes letter to a friend, letter to your Manager, Letter to your trainer and so on. Tip 1: while writing IELTS task 1 divide the letter into 5 paragraphs and 5 points. Before starting every paragraph bear in mind, about the bullet points you should write and mention the main idea that has to be expressed in the paragraph. TIP 2: Always follow the letter formation in a strategic manner. Formal letters follow one simple structure all the time. Tip 5: Do not stuff the unnecessary or personal details. Tip 6: Informal letter structure should always be as below. Close with Your first name. Task 2: Consists of 40 minutes. Before attempting Task 2 follows these 5 steps. 3. Introduce the answer which actually says the whole essence of it. 4. Body of the letter should consist of paragraphs which support the introduction with information and examples. 5. Conclude the letter by summarizing the content in the letter. Tip 7: Planning the essay will avoid the deviation from halfway or missing any important points to mention. Tip 8: Write complex and grammatically correct sentences, which impress the examiner. Tip 9: Though, the topics given for the essay are wide and open topics, do not stuff unnecessary information into the answer. Write only the relevant points. Tip 10: While answering opinion questions, advantages and disadvantages, given a problem and answers the solution, discuss both the views, and answer each in separate paragraphs. For Example, if the test taker has to answer the advantages and disadvantage, one should write advantages in one Para and disadvantages in another Para separately. 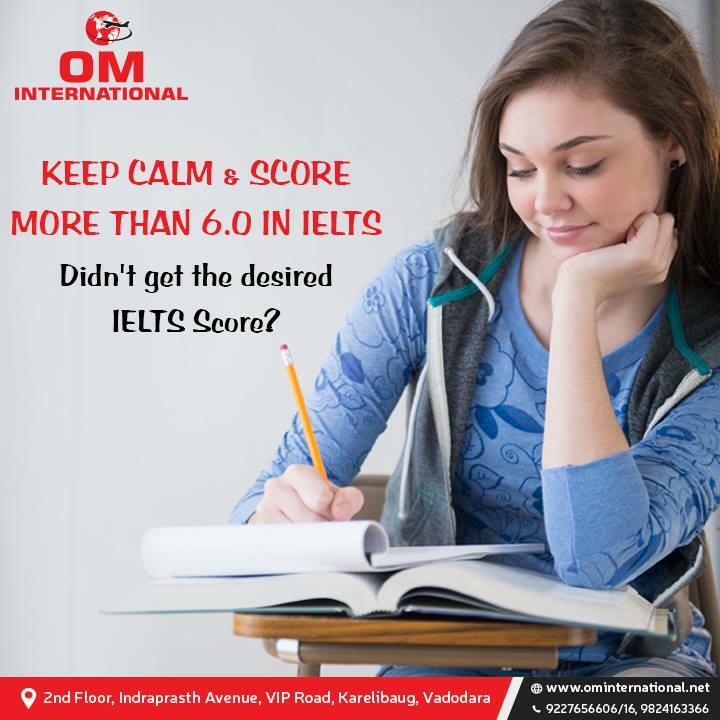 If you are taking IELTS test, contact OM INTERNATIONAL overseas, education and Immigration Consultants, who have an in-house coaching centre in Vadodara, IELTS, and PTE tests. The expert, qualified and well-experienced faculty help the test taker to score maximum for IELTS. to know more about the all the other options for your Study Abroad Program and immigration needs.